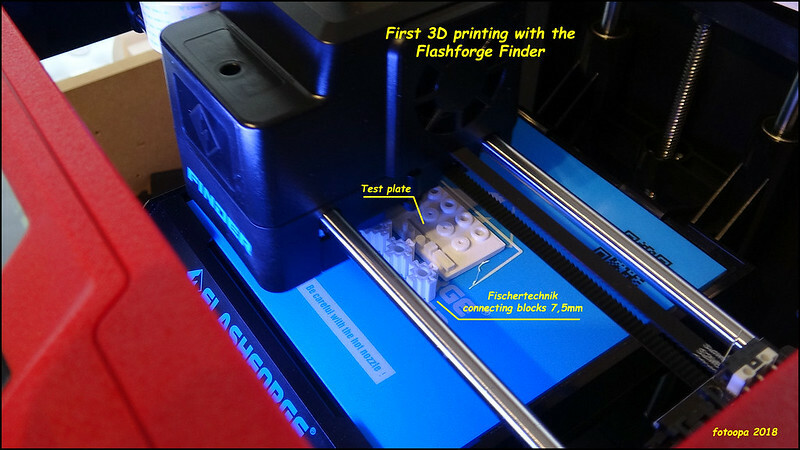 fischertechnik community forum • Thema anzeigen - First experiences with 3D printing. First experiences with 3D printing. When I recently saw the realisations here on the forum of the members I was immediately super motivated to be able to print 3D myself. I also got a lot of help from the forum member "Bello". I immediately started to look up some general information about 3D printers. However, I had no intention of having to put something together myself, so it had to be a ready-to-install printer. I also didn't want to invest a super high amount of money in something I don't know if I would use it frequently. That the dimensions are then limited and you don't have a heating print bed was the compromise that had to be taken. 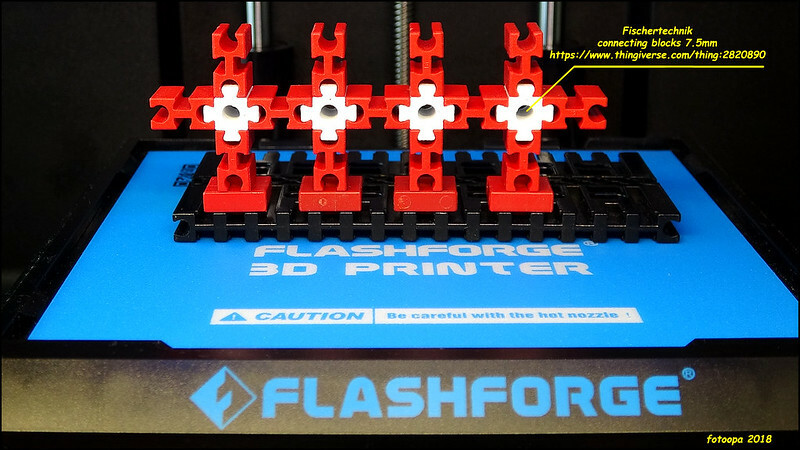 With the help of "Bello" the decision was quickly taken to buy a Flashforge Finder 3D printer. In a few days I had processed a lot of information, read user manuals, read print problems, filament choices etc. My birthday was coming, just in time to order the printer. It was delivered the day before and the grandchildren could give the gift! Enough has been said, now the first realisations. My first tests were taken from the dwonload files (Juh) of a 7.5mm connecting block. At the same time I had already drawn a test block in Autodesk Fusion 360 to measure the dimensions and deviations during printing. And yes the first 3D print was coming up, perfect result without a single problem. I had already given those images in the other topic but now I have a further overview. 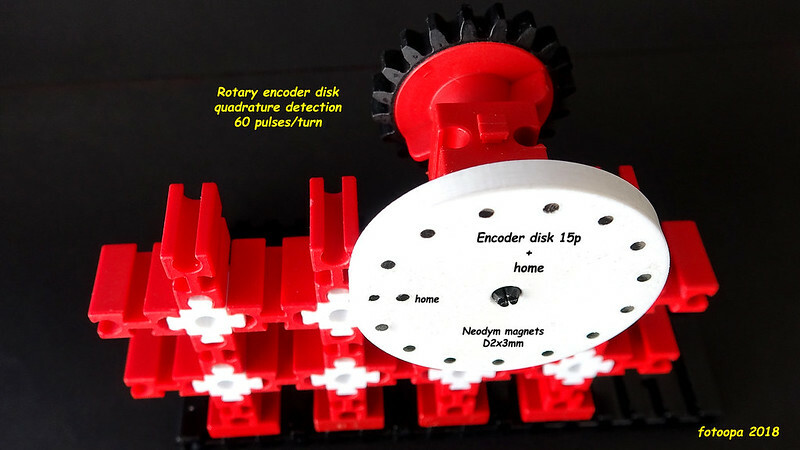 Meanwhile I have drawn an encoder disk for quadrature encoding. It is equipped with small Neodym magnets of D2x3mm. Also a home point is provided. 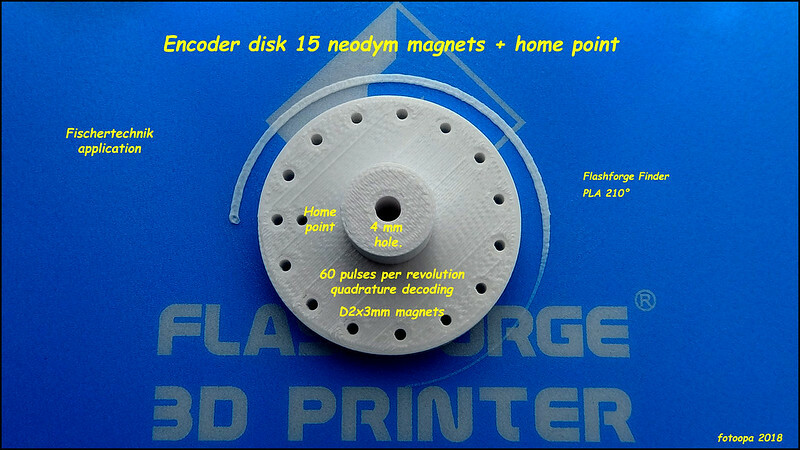 The encoder disk is also drawn in FS360 and contains an adjustable parameter "nr_mag" to make other disks without renewing the basic drawing. This picture was taken from the print table. The neodymium magnets are D2x3mm and are pressed in. First, the holes are drilled with a drill D2.0 mm. During the pressing you have to check the polarity of the magnets. The hall detectors are unipolar versions that I use. The central bore is drilled to size using a d4 mm drill. This gives you a clamp fit. If you want a free fit you have to drill out 4.1mm. Because the holes are already pre-printed, this adjustment can be made by hand. A small vertical drill stand is recommended. My next assignment is to design several small FT particles for a super ball track that I would realize again. Now I have many more possibilities. My school education was technical engineer mechanics. Afterwards I switched to electronics design to design machine controllers for 26 years. The last years before my retirement I also designed hardware for image recognition with Xrray machines. Hence some experience with optics and lasers. The next step will be to make my new creations available on Thinkiverse. I just created an account and later on the first results will follow. I am still a novice in all these new matters, There will be a lot of improvements. Re: First experiences with 3D printing. Congratulations, Frans! I am looking forward very much to your published designs! On the hole sizes: It seems all (FDM) 3D-printers print them slightly narrower than designed, due to different factors, one of them being the path finding algorithm of the slicer which has to translate a round path into distinct linear movements. So generally, you should be safe to design all holes slightly larger, thus reducing the need for post-print processing, without risking that your design won't work for others. Usually, I start with a ca .2mm larger radius and adapt that to size and situation (do I want a tight or loose fit? etc.). The 4mm hole in my 7,5mm building block is actually 4.4mm. Of course, this kind of messy trial and error approach is frustrating a bit, but it reflects what household 3D printers are able to do at the moment, and what not. On your encoder disc: I tried sth. very similar once with all of the magnets directly beneath each other, resulting in a more compact design. Of course, the tolerances in positioning the Hall sensor are smaller that way, but got it working alright. Anyways, I'm sure we can expect more great designs from you. I have to admit I'm slightly envious of the amount of time you can invest in these things in retirement! Yes, I've also made some test prints to determine the deviations and I'll come up with about the same values as you indicate. A hole to allow free sliding movement should be about 0.3mm larger. If you want to drill a hole to size, it is best to use the nominal diameter. This is the case for the neody magnets you wish to press. For the encoder disk I determined the distance between the magnet with a magnet D2mm as base. If you place a hall detector on top of that you should keep a distance of 2.4*3.14mm to the next magnet to get a perfect dutycycle of the hall detector and have a good strong coupling. The distance between the hall chip and the magnet disk is less critical, normally 1.5 to 2mm. My next task is to draw a housing for a dual hall chip on a small PCB and integrate it into a FT block. With that I would have a good quadrature detector FT block. For a quadrature detector, the mutual hall chip must be at a distance of 2.4*3.14*1.5mm. This gives you a pure 90° signal with 4 pulses per magnet. Yes when you are old you have a lot of free time. Unfortunately, you know that you can't keep on doing this endlessly. Health, less good visibility, play a major role in this. For the time being it is still reasonable, so I hope to be able to contribute a little longer on the forum. Today 3 grandchildren come on holiday for the whole weekend. They have 0.8, 3 and 5 years. I will not be able to print much this weekend. But that is also a pleasure at our age! I see that with your kind of education you'd want to design things up to standards! I'm completely self learned in technical and electronical regards, so I mostly read up only so much that I get things working and apply some healthy portion of gut feeling along the way. It's a different approach, but the good thing about hobbies is that the only important thing is having fun, so everybody to their liking! Concerning your encoder, do you plan to integrate the disc and the Hall sensor in one enclosure, so that the sensor doesn't need to be adjusted anew each time? BTW, I happen to be working on a somewhat related 3D print project based on this idea by Richard (NBGer), which I want to use for a robot arm based on my mini power motors. After finishing this, my idea was to develop a photoelectrical variant of this design which would allow for continuos movement beyond the limited 220° angle of a potentiometer. However, up to now I only planned for single, not quatrature encoding. What is your reason for going for a quadrature signal, when in a motor driven application (which I assume you are planning this for) you usually already know the direction of a turn? juh hat geschrieben: I see that with your kind of education you'd want to design things up to standards! It is especially the ability to customize your design. Standard is beautiful but sometimes you can do it much easier. If you have drawn something, you can also transfer it faster into a new design without having to start from scratch. That is certainly a nice solution to design. You are then bound to a certain encoder resolution per design. Yet it is certainly worth designing something like that. After finishing this, my idea was to develop a photoelectrical variant of this design which would allow for continuos movement beyond the limited 220° angle of a potentiometer. However, up to now I only planned for single, not quatrature encoding. For many applications a potmeter will work very well and is easy to determine the position. It also corresponds to an absolute value. In my time I used (industrial) many metal discs of 200 or 400 pulses. You could print something like that in 3D but you have to take into account that certain IR LEDs would go through the PLA! However, it would be nice to design something so small. What is your reason for going for a quadrature signal, when in a motor driven application (which I assume you are planning this for) you usually already know the direction of a turn? The reason for this is that a quadrature decoder remains perfectly accurate no matter how much you change the position. You can't guarantee this with the method FT uses. They try to correct well but in the long run it always goes wrong. Single pulse counting sometimes goes wrong when something is standing still but still just vibrating. A quadrature encoder never suffers from this. Once a home performed you may work months with it without error. If you make an extra home point on your disk then you have an extra safety for auto calib (reload) every time you pass over that point in the same direction. This way you get an abolute encoder. Unfortunately, the TXT Controller does not contain a solution for quadrature decoding, yet not at a decent speed. Therefore my FPGA is at least 1000 times faster and can process almost unlimited number of decoding simultaneously without having to struggle with each other's time. Micro controller can also solve this problem, especially now that there are a number of hardware quadrature decoders built in. But even then, an FPGA is even faster and more extended. The big problem, however, is that an FPGA has a hardware thinking language like verilog but most people are afraid to learn it. Still, verilog is even easier than C or C++ but you have to think a bit more hardware versus software. From a syntax point of view, they are very similar. Another disadvantage is that with an FPGA you start with a more powerful module and that is more expensive. You have to count on 100 euros. But this is a one-time investment. (https://www.mouser.be/ProductDetail/Ter ... dJ5w%3d%3d) There already exists a module that has an Arduino shield interface so you can use existing shield if you can't make your own hardware. That looks like quite a pretty big project! I wouldn't have the courage to develop now. But I still like to see how other people make something like that.